Excellent proving cruise in still airs and calm seas off Yarmouth and Lowestoft. All systems working well except my Navman 200 diesel fuel monitor/ rev counter which is duplicated my other instruments and so not important. This was a very long day started very early in the morning to make it something of an endurance test but we were well-prepared and served with constant drinks and food and assured by the fact of my very careful planning with made the best of the light breeze and tidal flows. My log book read that it was “an absolutely fantastic text book cruise, slow and tedious but calm and uneventful, saving fuel at 9 knots an d judging the wind to be with tide for calm and smooth seas. 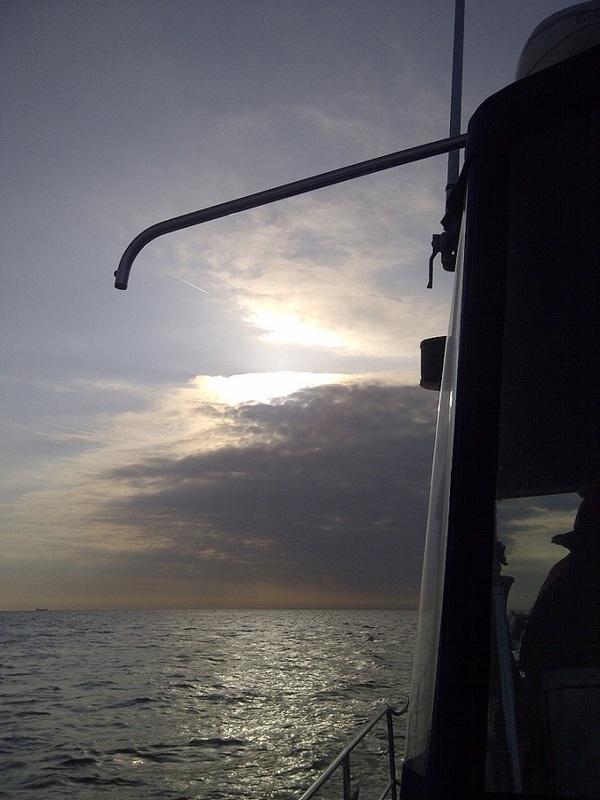 Visibility was surprisingly good even when the ‘breeze’ dropped to less than 3 knots!”. 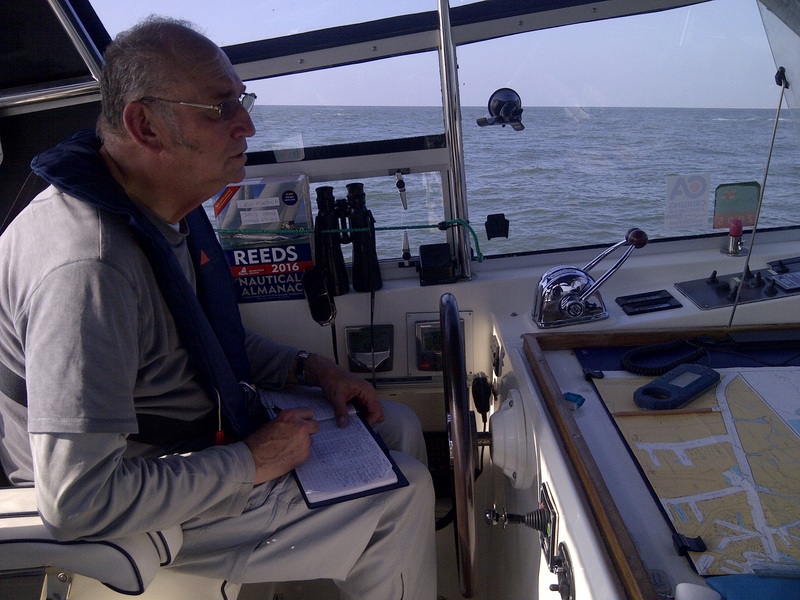 I had completed the engine checks again for safety and then we pulled out of Lowestoft around 06:15 local time and then, just clearing the breakwaters before dredger Orca came back to work, we set a course due East for The Netherlands. I decided upon the following plan of action to further minimise fuel consumption: A technique often used by slow-moving sailors crossing the English Channel, I set a course by autopilot dead reckoning without constant cross track error correction that would occur by having the autopilot navigating between waypoints. The strong flood tide carried us far further south but then the ebb tide corrected us and so we completed a perfect ‘sine wave’ course track that made best use of time and fuel. Our passage also took us well south of the Ijmuiden approach shipping lanes, threading us between their anchorage and the nearby wind farm and we then made a VHF radio call some 3nm out and had clearance to enter the port. I navigated us past the popular but expensive SeaPort marina up to the Kleine Sluis. 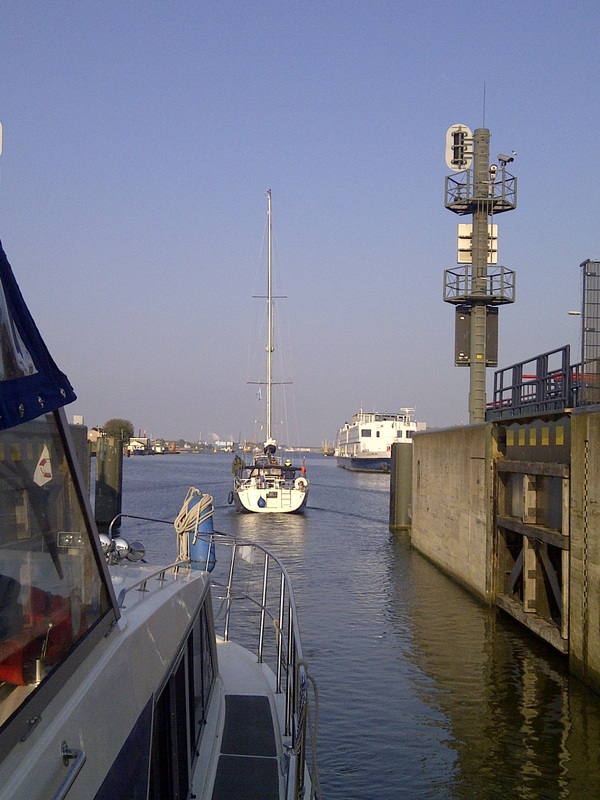 The sluis did not answer my call on VHF22 but I moored behind two other waiting boats (a German and Dutch sailing yacht) where we waited for forty five minutes for the gates open when we were quickly through. By this time, we were very tired and anxious to stop and rest and so I took us down a ‘side-canal’ and past the heavily commercial port of Beverwijk where we found that the port were in the process of constructing visitor moorings at the far end and so we went alongside, moored up and were soon ready for bed. We just had the energy to use the hot water to take showers before turning in for a well-earned sleep.